910 Fayette Street – Not the House I Thought It Was! 910 Fayette is at the bottom of the list. The little blue house on the left was 906 and 908 until the numbers were changed and then it became 910 and 912. 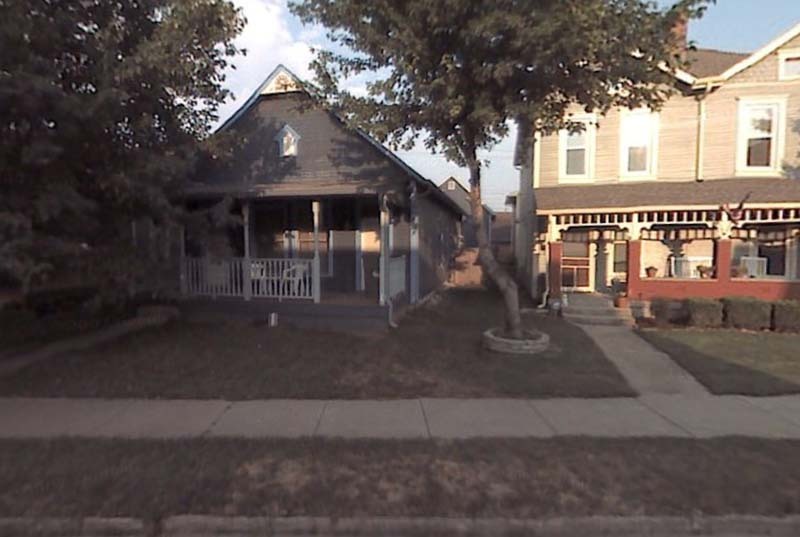 The two story house on the right was 910 and 912 until the addresses changed and then it was 914 and 916. This is a Google photo. When visiting Indianapolis a decade ago, my daughter Ayanna drove me around the city looking for family homes. We found nothing but parking lots and weed covered land where our ancestors used to live, until we found a little blue house numbered 910 Fayette standing and in good condition. I took this photo the day we found the house. You can see the number 910 on the door. My father, Albert Buford Cleage, Jr, was born at 910 Fayette on June 13, 1911. His parents had married the year before when Albert Sr. completed his medical training and received his physician’s license. I imagined how crowded it must have been with Jacob, his wife Gertrude, Henry, Albert and later Pearl sharing one half of the small two family home. Next, I looked at the Sanborn Fire Maps for Indianapolis, Indiana, to see how and if the house had changed over the years. The oldest map was from 1887. I could not find 910 Fayette. The street numbers only went up to 350. The next map was from 1898. I found the house on the forth lot from the corner. 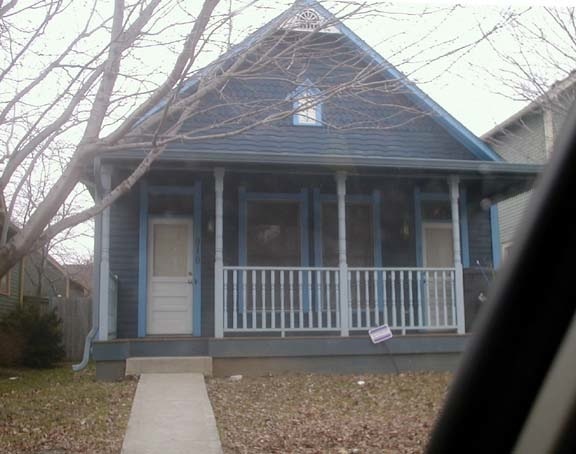 The house was a two story, divided frame house, with a one story room on the back and a porch across the front. The house and the small outbuilding behind it (outhouse?) had wood roofs with wooden shingles. The house number is printed in the street in front of the house with the current address, 910, closest to the house and the previous address (164) beneath it in parenthesis. 1898 Map. Red marks 910 Fayette. Using the number, 164, I went back to the 1887 map. I found a house on the third lot, numbered 162. Next to it was an unnumbered lot. It would have been 164 and it was the fourth lot from the corner. The house I was looking for had not yet been built. 1887 Sanborn Fire map. Red marks the lot where 910 would eventually be built. Next, I pulled up the 1914 Sanborn map and located 910 Fayette. I noticed that the house was marked as a frame house but with only 1.5 stories. Red again makes the spot. But wait, 910 is the third house from the corner on this map instead of the fourth. Looking at the fourth house, more closely, I saw that the number closer to the house was now 914 and the one below it, the old number, was 910! The house I thought was the one my father was born in was not the little blue house, but the larger house next door. Both houses were divided to hold two households. The former 910, now 914 Fayette. I found a photograph online at several real estate sites, of the renovated house. It looked like half of that house would be much less crowded for five adults and eventually a baby, than the smaller blue one next door. 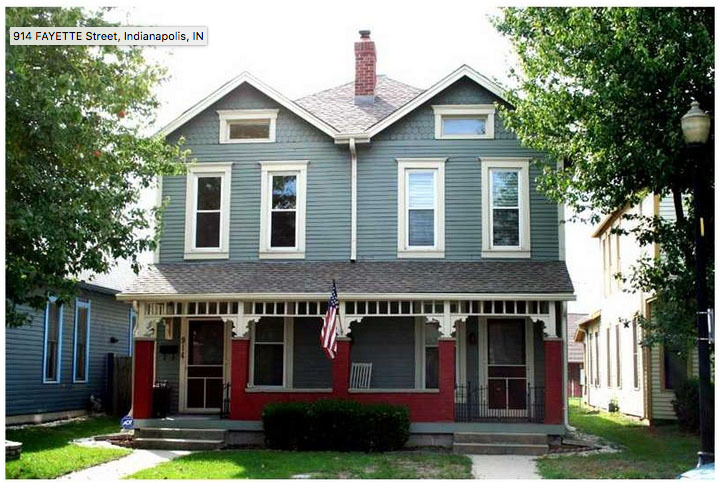 In 1905, it rented for $12.50 and had five rooms. My grandfather and his brothers and their families lived there from 1909 to 1912. At that time they spread out to larger quarters. 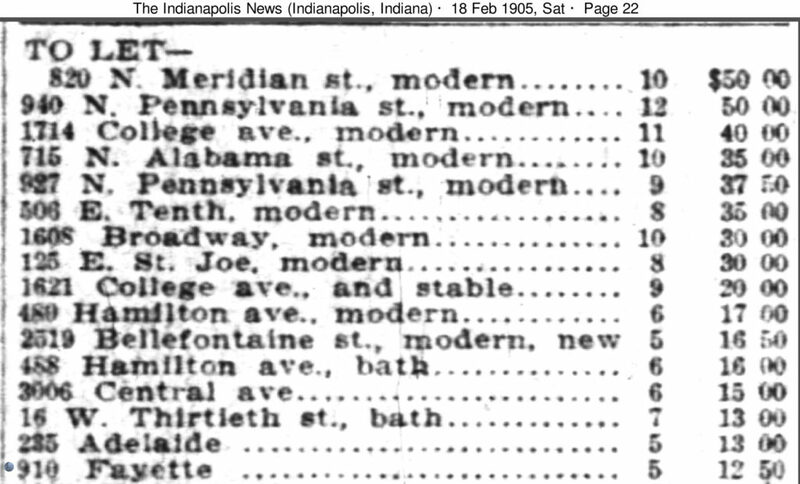 Go To this post to read an 1895 article about renumbering and renaming streets in Indianapolis – Why Renumber and Rename Streets? interesting and clever … 910/914. Interesting. I never new houses could be renunbered. It happened several times in Indianapolis during the years I’ve been researching. My grandmother mentioned that their address changed in a letter written in 1904. We lived in a house in Idlewild Michigan and they changed both the number and the name of the street. That change was because there were many lakes in the county and each one had a street named “Lakeshore Drive” which made it difficult for the fire department to find the right burning house in a hurry. 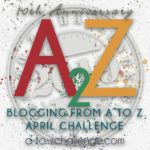 Why does all that renumbering happen? Good thing you are so good at staying on the trail and revisiting what appeared to be fact… love all the pictures! I wasn’t even looking for that house. I just happened to see the and for rent and I’ve been looking at the Sanborn maps for my letter project, so I looked for the house on Fayette and the story of renumbering unfolded. I found photos of the interior of the houses and they had both been gutted and redone with ceilings going through to the attic. No way to tell what the inside looked like over 100 years ago. I think I will try and find an answer to why they renumbered. When I find a house on google or have the chance to visit a town and look for an ancestors home, I’m always wondering if I’ve got the right house. Sometimes it just doesn’t seem quite right, but I’ve never researched it well – as you did! Good job! I sort of stumbled into it. I rarely find an old family home. 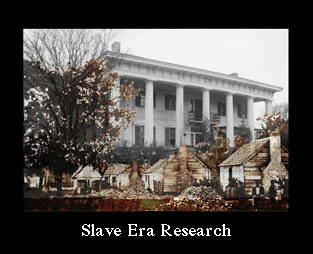 They have usually been torn down. We live in a house that was renumbered and when researching the history of the house it took me a moment to catch on. Counting houses from the corner and continuity of occupancy helped. The renumbering was significant. However I visited the house of my great great grandfather in Melbourne and was disappointed that it had been knocked down. Next door there was a fine house, obviously from the period, and I regretted that wasn’t his. Further research when I got home and I discovered it was indeed his and the Street had been renumbered very slightly after he died but before the death of his widow. My poor cousin is about to have her house in Adelaide renumbered as her neighbours have subdivided. She is dreading the confusion. 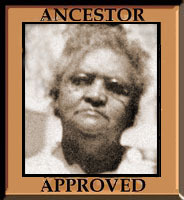 Her family have had the house since the early 1960s. This just goes to show that when we find our ancestor’s homes or the spot they were in, we should take photographs of next door and other houses nearby, just in case. There were quite a few articles in the newspaper during the time about the confusion caused by the renumbering. Especially problematic was that the city directory came out with the old numbers while they were being changed. good detective work! all the houses here look as if they hold such rich stories.